The advancement of technology has spread to all business sectors, leading to new career possibilities such as becoming a healthcare informatic professional (HIP). The field of healthcare informatics adapts and adopts information technology (IT) to deliver healthcare services to consumers. This IT delivery system has revolutionized how healthcare providers are able to assimilate patient information effectively and manage healthcare programs more efficiently, including facilitating patients to become actively involved in controlling their own medical data. This puts HIPs on the forefront of providing high quality, confidential, ethical patient care to the public. Healthcare informatics degrees can be earned in a number of accredited institutions of higher learning through traditional on-campus programs, evening classes or online formats. Degree seekers should look for schools and programs accredited by regionally recognized accrediting bodies through the Council on Higher Education Association (CHEA). In addition to school certification, healthcare informatics programs should hold accreditation by the Commission on Accreditation for Health Informatics and Information Management Education (CAHIIM) which provides educational standards for the curriculum and recognizes approved programs. Healthcare informatics majors will usually receive a science degree at their level of study, with programs most frequently offered through health, public affairs, or technology departments. The curriculum blends the latest in computer technology systems with healthcare trends and principles. Candidates can earn certificates, associate’s degrees, bachelor’s, master’s or doctoral degrees in the field. Doctorate or Master’s in Health Informatics Degree holders generally find greater job opportunities and experience more career advancements into mid-and-upper level positions within the field. 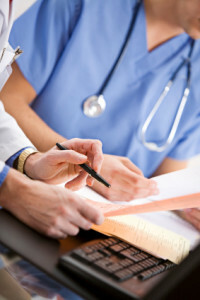 As part of their curriculum, students can expect to study: health records and computer management systems, professional ethics and behavior, legal and industry standards for confidentiality, healthcare coding, staff and program management, human and social aspects of healthcare information, principles of disease, statistics and research, pharmacology and participation in supervised internships in healthcare settings. Certification requirements for HIPs vary by state and locality, however, the Healthcare and Information Management Society (HIMSS) provides pathways for those with associate’s degrees or higher to earn national certification. This certification provides greater marketability and career advancement options for HIPs by documenting the competencies and skill sets employers are seeking. Candidates for certification sit for an exam that tests these areas: systems analysis and design, selection and implementation, healthcare and technology environments, leadership, management, computer support and maintenance, privacy and security, testing and evaluation. The CAHIMS certification is for those at the associate level with less than five years of work experience. The CPHIMS certification is for professionals with five or more years of continuous employment in the field. Healthcare informatics offers a wide range of job possibilities from entry to upper-level positions within private and public healthcare settings. Job responsibilities depend upon the position and may include: inputting and coding data, program development and implementation, staff instruction and training, systems’ coordinating and analysis, project management, and staff supervision and management. Examples of work settings include hospitals, colleges, government agencies, research facilities, insurance companies, pharmacies, and rehabilitation and nursing care facilities. From entry level positions to upper ones, those with careers in the healthcare informatics sector will see an increase in job opportunities at a much faster than average pace through 2022. This demand is rising due in part, to an aging population and with that their increased health needs as well as their retirement from the workforce. If providing cutting-edge public health services through innovative, technological programs sounds rewarding, then a career as a healthcare informatic professional may be the right track to pursue.